Traditional truite au bleu utilizes live trout, frequently difficult to acquire. This adapted recipe is evocative of the original concept. Fresh trout, 2 each, usually 12-16 oz/325-400 g per trout. White vinegar, 2 oz/60 ml. Radish, sliced thin, 1 each. Parsley, chopped, as needed, approximately 1 Tablespoon. French bread–we used baguette, but any firm bread is acceptable. Immersion circulator, portable or stationary. Heat rated container, minimum of 2 gallons/8 liters. Heat rated sous vide bags. Channel or chamber vacuum device. Tablespoon for boning the fish.–no professional server leaves home without one! A clear Polycarbonate container for use with your immersion circulator. A dedicated, tight fitting lid for your circulator, which practically eliminates vaporization. A sous vide rack, which insures efficient transfer of heat and circulation of water. Stage each individual trout into a dedicated vacuum bag. Add 1 oz/30 ml of the vinegar and 1/2 teaspoon of salt to each bag and seal. Set aside until the timer goes off. After the hour has passed, add the fish to the tank and turn off the heat. Set the timer for 10 minutes. After the time has elapsed, remove the vegetables and the fish from the bath. Cut off a small corner of the bags with the trout and the vegetables and drain the liquid into a small sauce pan. Stage the vegetables into a dish and keep warm. Reduce the liquid until you have no more than 1 oz/25 ml. While the broth reduces, cut the cold butter into six pats. Add the pats of butter one at a time, swilling the pan as each pat of butter melts, adding one pat at a time. It is not really necessary to use a wire whisk, but some people find it helpful. The temperature of the butter sauce should not go below 160 F/70 C. After the last pat of butter has melted, pour the sauce into a plastic squirt bottle or goose neck. Set aside. Remove one of the fish from its bag. Place it on a plate as depicted above, with the back facing you. Use a spoon to remove the head. Use a knife to make an incision from head to tail, ABOVE the dorsal fin. Gently grab the skin at the corner and pull. Expert waiters can remove the skin in one piece, but it is not really necessary. It is worth giving a try though. It never seems to work when someone is watching! Use the spoon to draw a line down the visible seam. Remove the dorsal fin. Use the spoon to push the upper and lower halves away from the backbone. Grab the backbone at the largest end and lift, pulling it towards the tail. Take your time. With a little practice and a little luck, the backbone will come out in one long piece, removing most of the bones with it. If bones remain, they will be the fine rib-cage pin-bones nearest the head. They can be troublesome–one should never expect a fish to be completely boneless, even in the finest of restaurants. 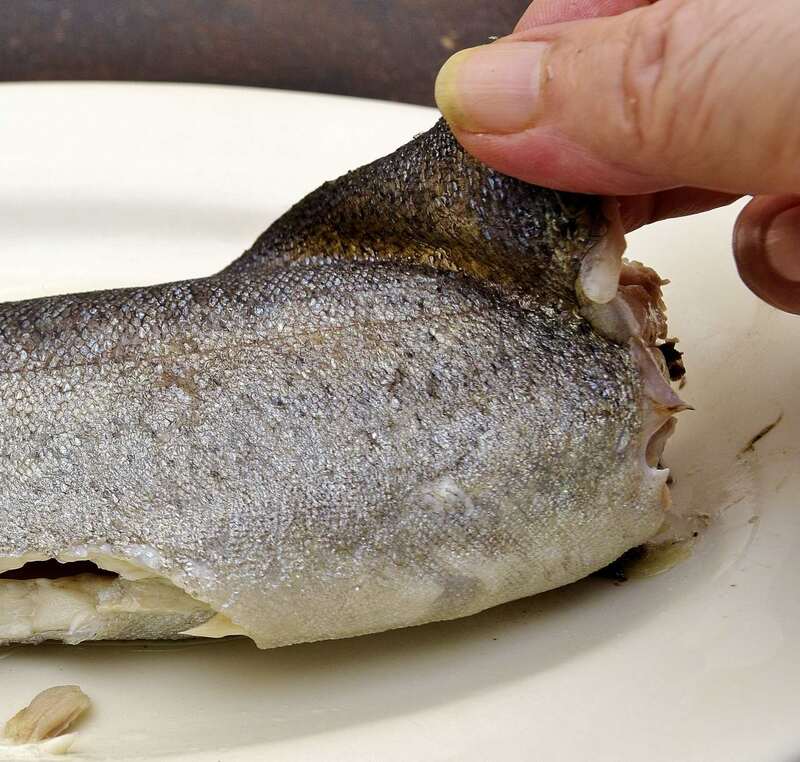 Gently fold the upper and lower halves back on to the fish, or leave open–both presentations are perfectly acceptable. Place a few of the vegetables on the plate as shown and sauce the fish liberally. Chopped parsley, of course! It looks even better up close. If you love capers as much as I do, sprinkle a few on top as well. So simple, and yet so appealing! I must confess, I do not typically process seafood using sous vide. Fish proteins are very fragile, and sous vide tends to “tenderize” them whether they need it or not. 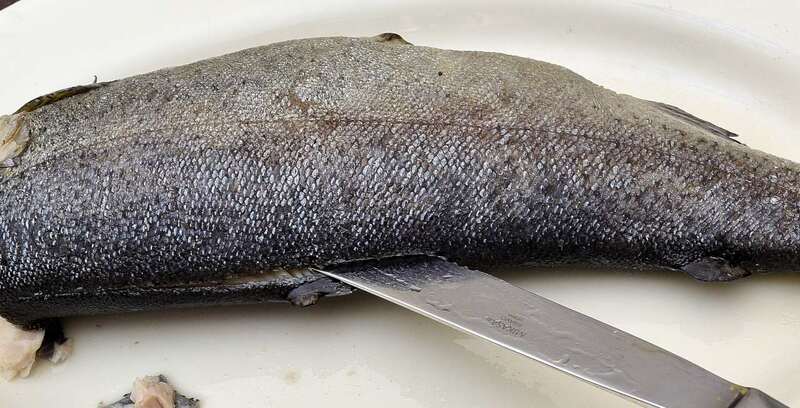 Applying a crust after processing usually takes as long as it would just to cook the fish in the pan in the first place. Even so, there are a few fin fish that sous vide works well with–trout, of course, and salmon. I find flatfish like halibut and Dover sole just too delicate. It is even difficult to remove them from the bag. There is no accounting for taste! Sous vide processing converts collagen to gelatin by design. Fin fish contain almost NO collagen and require no tenderization--quite the opposite. Many preparation methods for fish endeavor to make the flesh seem LESS tender as opposed to more so--crisp crusts, acidic treatments, dry curing/smoking, etc. Using freshly dispatched trout and vinegar in the broth result in a firmer end product. We didn't have live trout--but we did add vinegar to the bag. This dish is of French origin but is not usually considered fine dining. This dish is rustic and rather the French equivalent of the New England Boiled Dinner; informal, casual, and utilizing readily available ingredients.